Is your inner world full of uncomfortable emotions and bodily sensations, unmet needs, and self-defeating thoughts? Current brain science shows that a lack of consistent emotional nurturance in infancy and childhood, when the brain is being formed, can result in difficulties with self-regulation, causing us to seek comfort and nurturance outside ourselves, often in substances, like food, and behaviors such as overeating. The good news is that our history is not our destiny and the brain can be rewired. 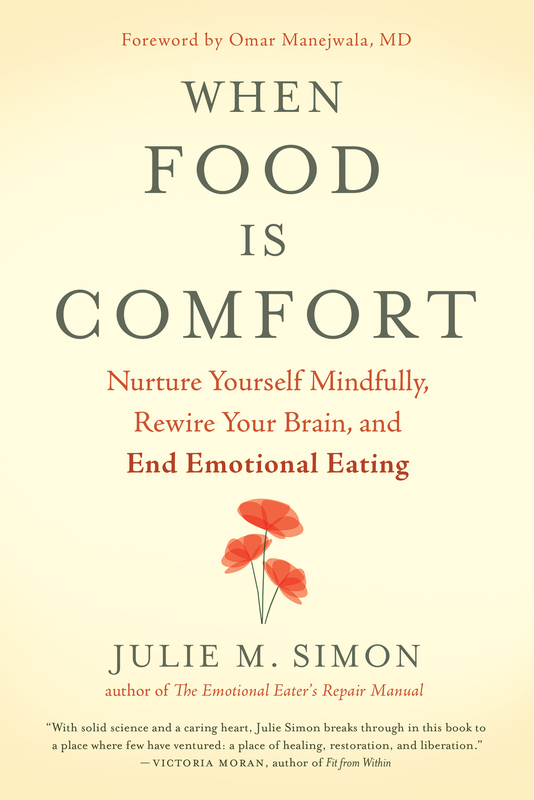 In When Food Is Comfort: Nurture Yourself Mindfully, Rewire Your Brain, and End Emotional Eating, author Julie M. Simon, explains that emotional overeaters can learn to self-nurture instead of turning to food for comfort, through the simple, easily masterable skills she offers. We hope you’ll enjoy this excerpt from the book. Imagine that you just had an argument or an unsettling discussion with someone. Now you are by yourself, and as you begin to process what just happened, you feel an overwhelming urge to go get your favorite comfort food. Rather than giving in to this desire, you pause for a moment and attempt to set a limit with yourself. What does the voice in your head sound like? Does it sound like a neutral adult voice, helping you adjust your behavior by stating the facts: “Those donuts are fried and really high in calories”? Does it attempt to set a limit, saying something like “No, let’s not get donuts — we’ve had enough sugar today”? Does it remind you of past experience: “Better not head to that drive-through; you’re going to order something fattening and feel bad about it later”? Is this voice critical and shaming, saying things like “You’re never going to lose the weight, because you’re just too lazy and undisciplined”? Or is it gentle, nurturing, and understanding: “Yeah, that chocolate chip muffin looks really good, but it’s loaded with empty calories, and eating wheat makes our head feel stuffy, so let’s find a healthier treat”? If you’re like many emotional eaters I work with, that voice in your head tends to be a mix of all three voices. But it’s likely that the voice you hear most often is the neutral or critical voice, and the nurturing voice is underdeveloped. As we grow and develop, we internalize the voices of our caregivers, extended family members, siblings, and mentors. After we spend years listening to these voices, they become automatic and habitual. We’re often unaware of them. They represent our thinking self, the part of our personality that emanates from the upstairs part of our brain. This part, which includes experience, knowledge, intellect, wisdom, rationality, morality, and logic, drives and initiates action and makes decisions. Our thinking self can sound like a neutral adult voice, a helpful or destructive Inner Critic, or a caring and kind Inner Nurturer. Our Inner Nurturer must act, at times, as our Inner Limit Setter, capable of setting effective, nurturing limits. If our Inner Nurturer acts too often as an Inner Indulger (“Yeah, that was a stressful meeting — we deserve a pastry”), we get into trouble with overeating and other unhealthy habits. Our feeling self, the emotional, childlike part of our personality, represents our intuitive, sensing, vulnerable, feelings-centered, spontaneous, pleasure-seeking, wonder-filled, imaginative, authentic core being. We all have a playful, instinctual inner self, even though we may not be in touch with it. This part of our personality emanates from information received from our body and downstairs brain, and it does not change as we grow older. If the adult voices of our childhood were primarily nurturing — warm, kind, validating, loving, soothing, calming, encouraging, hopeful, and helpful — we develop, early in life, a supportive inner voice that can restore us to emotional balance when needed. This voice also helps us regulate our behaviors. As we mature, this becomes the voice of our Inner Nurturer, our main source of validation, approval, reassurance, calming, soothing — and limit setting. If we don’t receive sufficient nurturance in childhood, we fail to internalize this kind, calming voice, and we continue to try to get our need for nurturance met from the outside. As adolescents and young adults, we may still seek comfort from our original caregivers, especially if they were able to comfort us some of the time. This approach, however, generally leads to frustration and disappointment as caregivers reopen old wounds by failing again to provide consistent, reliable comfort and support. As adults, we may seek nurturance from those closest to us — our partners, spouses, close friends, mentors, and peers, and even our children. This often places too much burden on others. Close friends and family members aren’t always available at a moment’s notice when we’re in distress. Our children are just starting their own lives and don’t need us leaning on them. Other adults in our lives are busy, preoccupied, and struggling with their own issues. Sometimes those who care about us relocate or become ill and can’t offer us support in the way they once did. Depending excessively on others for nurturing and support is draining for them, and one-sided; they probably feel that they could use some nurturing from us at times. Some of us compensate for our unmet need for comfort and lack of self-nurturing skills by becoming super-independent, unconsciously disowning these needs. Denying our needs does not, however, get rid of them. To minimize the discomfort they cause, we may attempt to overcontrol our lives. We become rigid and inflexible, lacking the adaptability that good mental health requires. One way or the other, we end up expecting too much from others or from ourselves. Our lives become imbalanced, and we fail to develop this supportive voice within. It’s important to understand why you regularly turn to food for comfort: it’s likely because your inner world is full of uncomfortable emotions and bodily sensations, unmet needs, and self-defeating thoughts. You may be keenly aware of your feelings and needs but have a tendency to become overwhelmed by them and paralyzed by negative thinking. Or you may be only vaguely aware of these signals from within, cut off from the wisdom of your body and mind. In either case, food can seem like a quick fix. Checking in regularly with your emotions, bodily sensations, needs, and thoughts is an important self-care practice. Learning to name, experience, and track our internal states is a skill that we begin to acquire in childhood and continue to develop throughout our lives. If you’re disconnecting from your inner world because no one ever helped you learn this skill, it’s not too late. Emotions, bodily sensations, and thoughts are like street signs pointing us in the direction of our needs, and you can learn to recognize and read these signs. Becoming aware of your feelings, needs, and thoughts is a critical first step, but it isn’t enough, on its own, to create lasting behavioral change. You’ll need to learn how to stay with and process your feelings, reframe self-defeating thoughts, and meet your needs. For this you’ll need the help of an internal nurturing voice — a mature, wise, loving, validating, unconditionally kind, affirming, encouraging, soothing, comforting, protecting, hopeful, and always helpful voice. Because many of us did not receive consistent, sufficient nurturance from caregivers as infants and small children, and perhaps still, as adults, have little contact with nurturing others, we have never fully internalized this voice. Without it, our very young feeling self is often running the show. Through therapy and contact with kind, nurturing people, it’s possible to “borrow” and practice a soothing voice in order to manage unpleasant feeling states and reframe self-defeating thoughts. This alone can create new neural circuitry and change your brain functioning for the better. But one or two therapeutic sessions per week won’t cut it — you need lots and lots of practice to develop this nurturing voice. You need a protocol to follow, a skill set, and a bag of tools. Julie M. Simon, MA, MBA, LMFT, is the author of When Food Is Comfort and The Emotional Eater’s Repair Manual. She founded the popular Los Angeles–based and online Twelve-Week Emotional Eating Recovery Program and offers workshops at venues like Whole Foods and UCLA. She lives in Los Angeles and you can visit her online at www.OvereatingRecovery.com.